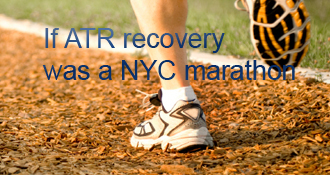 I’m starting to understand why Dennis linked up an ATR recovery with the NYC marathon. My injury was 3/18. At first I was frustrated to have to wait a week for surgery, which didn’t happen until 3/25. I felt like I was laying around the house waiting to start healing. That was lost week, because as far as I was concerned, my clock didn’t start ticking until surgery. Now, post surgery, I’ve got the same feeling. There’s a very loud voice in my head telling me that I’m not making any progress until I can start ROM or strengthening exercises. My 6 week post op is Monday 5/5. Doc told me to bring a shoe with me, so I’m hopeful that I’m about to start something in the way of PT. I’m not a terribly patient person. This next year is gonna be TOUGH. I’m glad I stumbled across this site. Hearing more stories and warnings and encouraging progress is definitely a help. Good luck to all of you.